Sarmaua is a food prepared from minced meat (usually pork, and beef, mutton, poultry or fish), mixed with rice and other ingredients, wrapped in cabbage (fresh or sour (pickled), steve or vine leaf etc., in the form of roll. In Romania is usually served with polenta and sour cream. In Romania the dish is made especially on the eve of major religious holidays (Easter and Christmas), but is cooked as well on any other day of the year. 1. If the cabbage is fresh boil it with plenty of water and a little vinegar until the leaves soften a bit as you run them. If the cabbage is pickled it is used as it is; it should not be scalded. 2. Loosen the leaves of the cabbage and if the spines of the large leaves are still hard carefully cut them out. Depending on the size of the cabbage leaves you can leave the entire leaf or break in half. 3. For the filling, use mincemeat containing some fat, as this will make the filling moist and tasty. 4. Grate the onion and cook in 2 tablespoons oil until soft, remove from the heat and stir in 1 teaspoon paprika. 5. In a large bowl mix all ingredients for the filling, including the cookedonion, chopped parsley and the 100 ml broth.5. On the bottom of a tall pot put half the shredded cabbage leafs, 4 slices bacon and the dill. 6. 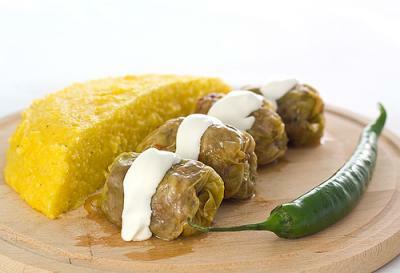 Shape each sarma using a cabbage leaf and a tablespoon of filling. They can form in your hand if you have experience, or make them on a plate. - Place the leaf on a plate, at one end put a spoonful of filling. Lift the long edges running from the opposite end. and roll into a ball. 7. Place the sarmale in the pot, some on top of the others. This recipe will make about 35 small stuffed cabbage leaves. Lay the remaining bacon on top of the sarmale,with the remaining cabbage and the thyme and pour 150 ml broth over the whole dish. Top up with boiling water if necessary. The sarmale should be covered. * Cooking time depends on the size of the sarmale. * You can simmer covered for 2-3 hours in the oven at 180C10. Serve with sour cream. This is a very healthy dish already.